Changing Lives, one at a time! We thank you for leaving your thoughts and prayers with us in the comments section. However because of the internet bot spam, we need to close the comments section. Please continue to use our Facebook page to let us know your thoughts. 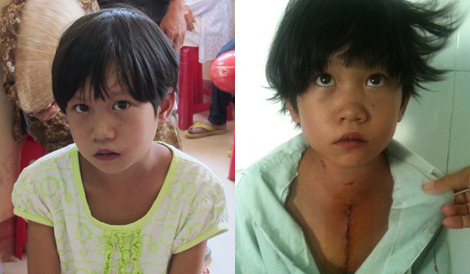 UPDATES: Hoang Thi Thu Thao, the young child we blogged about while on Mission, just had her heart fixed on Monday August 8, 2011. It took several weeks to get her prepared and scheduled but finally surgery happened. She is now healed physically and spiritually. Dam Thi Quynh Khanh: 18 year old girl from Phu Vang Hue. She lives with her mother only as father died when she was young. She had 2 operations for her heart and had not corrected the problem. We pray that the next surgery will be finally successful for her. She is up next. This story can be filed in the rare and unusual category. After we finished our first week of work, on Saturday I traveled north to scout locations for Mission 2012. Traveling by private car with my driver we passed the 17th Parallel, the line that divided Vietnam before 1975. I had never been over that road before so we stopped and took a picture of this historic place. The bridge on the left hand side of this picture was where prisoners of war were exchanged. We got back into the car and my driver asked: "Just over there is a family with some sick children, could you stop and check them out? I promised the family one day I will bring a doctor to see them." Wow that was pretty bold of him to promise something like that. What are the chances that he would be driving a doctor on that road? He apparently knew this family for a few years now just by stopping there often when he took tourists to visit the north. Well, since I always carry my medical bag traveling inside Vietnam I said "Sure, why not?" We walked into a little house with a little shop in the front and inside there is a family of 5, the parents and 3 children. They wanted me to check out the 2 boys. This couple had their first daughter 20 years ago and she was healthy. Four years later they had a boy and to their dismay, he was born with 6 fingers and 6 toes. Other than that the young child looked normal until he was a few years of age and then they noticed he can't see as well while getting around the house. His mental capacity is also slower than children of his age in the village. They took him to various doctors in Hue and Saigon; had various tests done but no one could tell what the problem was and just gave him glasses which didn't improve his vision. As he grew older, his vision worsened. He could only see lights and shadows but can't read. The parents were sad of course and thought of his future. �Who would take care of him should the older sister got married and they passed?" they asked themselves. So they decided to have another child just so this child could take care of his brother in the future and so 11 years after their second child, a third child was born. To their dismay, this child too has 6 fingers and toes. Immediately they knew the fate of the child. Indeed as this third child grew older and is now 5 years old, his vision is blurry just like the brother although mentally he is a little bit better. As I examined both children, the 2 other findings that appear to be abnormal were their weight and one other. The rest of the family are thin yet both of them are a bit overweight. I had to dig far and deep to find a diagnosis and it is indeed a rather rare disease. This is one we only read about in medical school and I would dare to say 99% of us never saw one. Dr. Marti Baum and Branch were pretty good in recognizing the syndrome when described to them. According to the literature, there are only about 600 of these children worldwide and they suffer from a condition known as Lawrence-Moon-Biedl Syndrome, yet 2 of them sat right in front of me. It was sad to inform the family of the fact that there is no cure for it and the only thing they could do is to have regular check up to monitor for their kidney functions as the kidneys may fail in the future. May God bless and keep them in His hands. This is the true story and it begs to be told. Until I have� permission to publish the names with the story, for now the names will be withheld to "protect the innocent". During the Vietnam war, there was a South Vietnamese soldier, captured by the North and placed in prison in the North. As the war ended, he was released to return home to the South. He was released without any money or possession as any POW would be. Traveling on foot for a week, he became weak with hunger and met a man. This man was his former enemy, a Viet Cong soldier who fought him on the other side. Yet this man was "a really nice man". He took the South soldier into his home, gave him food, water and shelter for the night. The next day he even gave more food, water and money to the South soldier to help get him home. This South Vietnamese soldier eventually immigrated to the United States. For the past 35 years he made sure his children never forget the good deeds of that North Vietnamese soldier by retelling that story to them over the years. In November 2010, one of his children found the Good Samaritans, applied for a position and was accepted into the team. This young man traveled back home to Vietnam with the team simply as a member of the Reception team. His job would be to care for patients, taking them from room to room or wherever they needed to go. On a hot Wednesday afternoon of the second week, as he was doing his job taking patients around the clinic, he was stopped by an elderly man who came to our clinic for medical help. This man asked if he was the son of Mr. ABC as he looks exactly like a person that he met so many years ago after the war. This young GSMDM member was so surprised that someone here in Vietnam would know his father and thought it was a mistake because there are so many with the same name. But he said "Yes, that is my father" and the conversation ensued. This man now shared with our young team member the story of a man whom he encountered thirty some years ago after the war. It was the exact story that his father had told him not to ever forget. Later that evening the member called home to once again confirm the story and indeed the man he met at the clinic was the same man who was once a Good Samaritan so many years ago to his father. "This is a gift from God to have my son meet him instead of me after all these years. Knowing that he's fine and that the ministry was able to give him a checkup is great news already. Even though we weren't able to see each other again, I trust that what he said to my son and what my son has told me is true and not a coincident. I'm sure it is God's way of telling me that he's alright. I would like to thank you for accepting my son into your ministry because this would never have happened if you didn't." The story illustrates the fact that being a Good Samaritan has no borders and it's even more significant to be a Good Samaritan to your enemy. Love has no border and an act of kindness will never be forgotten! We hope that these 2 men would soon be re-united and fully respect their privacy and ask that all who know this story to do the same! This blog today is just some random thoughts on our last day as I get a chance to breathe. In the coming days and weeks we will share more of what was done and the individual lives that were touched and changed. Mission 2011 is now over for the Primary Care Team today due to a scheduling conflict with the local agency. The A and B teams worked 9 days, treated a few thousand medical, dental patients and gave out just about the same amount of eye glasses. The surgical team operated on many patients, a lot are on the referral of the primary care team and just today alone, Friday, while the rest of the team is resting before heading home, the surgical team still has 15 patients on the schedule. There are a lot of patients referred from the University Hospital for surgery as well, especially the cardiology department. Our cardiologist didn't even have enough time to sleep sleep. We pray for strength for him to finish out the day. Every where we go, at the end of the day, week, the local agencies always want specific numbers of how many of this, how many of that. It's all well but for us it's not the numbers that counts. It's about that one single individual sitting in front of us; it's about his/her life and suffering. Our young volunteer team are encouraged to see the patients for who they are. The history team may be dead tired asking the same questions as to where the headache or back pain are and there are so many of those, but behind those headaches and back pain are life stories that are often forgotten by others. It isn't about how a skillful surgeon can make a new ear out of a rib, but it's about the life of shame for a young lady who lived so many years without one. Almost every night after dinner our team had a chance to share our thoughts and feelings about our journey here, what we saw, how we felt and the impact it has on our lives going forward. There are too many among the team of almost a hundred but in time we will share them. This patient below was given up by her physicians in Saigon and traveled to Hue to let us touch her heart with a pacemaker. She still has a way to go for full recovery but it is started. These patients below had various types of surgeries, although their medical conditions are taken care of never to be concerned about but that alone can't alleviate fear of the future. You can see it on some of their faces.� Our surgical skills can't heal them all but our hearts certain can. The little patient on the left suffered from a bleeding disorder. All we could do was to give her a temporary relief for a few months. The young man on the right has reflux of urine back into the kidney causing Hydronephrosis. We asked our local urologist to help us extend the healing to him. Big smiles for a few simple procedures. This man with the hip fracture we previously reported.�Our financial policy / guideline�prevented us from paying for his surgery but that doesn't prevent our team from showing their love in a meaningful way. He is recovering well and will be able to walk, work to provide for his family in the near future. This surgeon from the University Hospital came to us saying: "There has never been a team like the Good Samaritans here at the hospital." He meant we don't do any spectacular procedures like other teams but there something special and unique about our team. That will cap a good 2 weeks for our surgical team! Today is another eventful day. Our surgical team arrived into Hue on Sunday afternoon and had no rest. 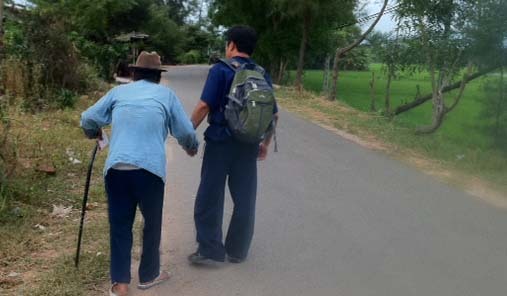 The team started seeing patients at Hue College of Medicine immediately. The 5 specialist teamed up with their respective colleagues and went to work to select and prepare patients for Monday. Monday morning the team was warmly received by the Medical College. They even received welcoming gifts. But minutes after that welcome, they were whisked to the operating rooms where patients were waiting on the table for surgeries. Over the next several days, as time permit, we will bring you stories from each of our specialists. For Monday we focus on the Electrophysiologist, Dr. Walter Atiga. After Mission 2010 was over, Dr. David Le, the dental director from Leesburg Virginia planned a golf tournament to raise money for our Mission 2011. In May the big event happened and one of the golfers was Dr. Atiga. He was touched by what he saw during the dinner presentation and immediately wanted to participate. Over the next month he made arrangements on his schedule to fit the Mission schedule but by then, the short remaining time may not be enough to get equipment donated. So he thought he may have to delay the trip until next year. Yet he kept on trying and his efforts brought forth much fruit. Biotronik Pacemaker Company generously donated 12 pacemakers, valuing at $5,000 - 7,000 USD each and the Mission for Dr. Atiga was on. The Medical School was excited and put out a call for the Central region provinces to select patients for these special procedures. Hospitals around the country started to send their patients in. They came from Daklak, Quang Binh, Quang Tri and even Saigon. The University normally performed 1 procedure a month and now in 1 week, 12 highly technical procedures will be done. This patient came from Saigon, a 48 year old woman who had been seen by the cardiac center there and was told there was nothing they could do for her but to take medications and hope for the best. She faints easily and has severe chest pain frequently. Her quality of life as well as her family's had been reduced to nothing. Her husband can hardly work anymore because of her severe heart condition. In desperation they called us directly for help. After reviewing records sent to us, Dr. Atiga felt this patient can be helped and she was immediately notified. Traveling all day from Saigon they came to see us at our usual �After dinner specialty consult clinic�. After a full evaluation it's determined that she has Hypertrophic Cardiomyopathy with outflow tract obstruction. The placement of a dual chamber pacemaker will drastically change her life. There are 11 patients already scheduled and she was blessed with the remaining 12th. Because of the severity of her condition, she is now being admitted for this special procedure on Tuesday morning. We pray that the procedure will go well and that another life will be changed forever. Our patient with a fracture hip had successful surgery today and is recovering. Our young child with congenital heart defect is in the hospital and the cost of surgery is fully paid for, wating for surgery. Please continue to pray for her and the family. They already found the real peace! This past several days were even more hectic than the first few, even for the weekend.� The team is doing well however and spirit is high and ready for the new week.��Sunday meetings and singing�today was just wonderful and it was even more encouraging to see so many more lives being changed for real. All of our surgeons arrived safely today.� The 5 specialsts started seeing patients immediately on arrival and even for Sunday at the University Hospital to get ready for Monday morning.� We started the Pre-op at 5PM and got home at 7:30 PM only to see another 20 patients referred by the primary care team. There are so many surgical cases waiting for the team.� These patients have no mean to pay for their care and would not have it unless we are here.� Just some of the examples we will report later on are patients who were selected by cardiologists around the country to come and be treated by Dr. Atiga.� They came from Saigon, Ban Me Thuoc, etc... There are 11 patients who will receive various types of literally life saving pacemakers. Congenital heart defects kids also lined up today.� Our Pediatricians, cardiologist reviewed their cases for surgery later on. Please continue to go with us with your prayer and support.� We will have more photos and stories for you later. Another eventful day has ended. There are so many stories to tell, following is just one side from the perspective of one team, Team B. Team B with 4 doctors saw 213 patients today at a health center 14 km from the center of Hue. In years past when we came here, the nearer we were to the city center, the "less" sick patient we saw.� That's not true this time. This 38 year old woman came to us complaining of not being able to eat solid food for 20 days. She is able to drink liquid but any solid and she would vomit it up, choking on it. We sent her to get "scoped" and the gastroenterologist was not able to pass this scope through the esophagus. It appears that there is a cancerous process going on. Our policies won't allow us to treat cancer as our resources are limited but in this case, we must find it and at least find a way to get some nutrition to her. As we talked with her she kept saying "I am so hungry." This young child was a congenital heart defect where she only has one Ventricle.� She was offered surgeries years ago but family is unable to afford it. Now she is blue as can be and her fingers are all "clubbed" due to the lack of oxygen.� We need to move quickly on her.� Last week, a young child died waiting for our arrival. We've got to get this one cared for.� We pulled some strings and got her seen by the cardiac surgeon at Hue Central Hospital. Please pray that she can be operatead on successfully next week. We thank the Little Red Scarf for partnering with us on these children. This 48 year old man came into our clinic riding on the back of bike.� He was not able to stand. He fell 3 days ago and was not able to get the care. He knew our team was coming so he waited. An x-ray revealed he is a complete fracture of the femoral neck. The only treatment is replacing that hip.� We knew it would be expensive but didn't know how much it would cost so we called and the message relayed to us was $200. We thought "Wow, this is great, we can help him". So we sent him to the University for surgery. When he was seen, we were informed it would be $2,000. We had misunderstood the original conversation. 1. Send him home knowing he will not be able to care for his family any more. 2. Cut our surgery budget next week by 10 patients and allow him to have the surgery. The entire team was very adamant that these 2 options are not options at all. This one life must be changed and unanamously voted to donate their own personal money to make this happened. Thank you team! On the surgical side of our team, Dr. Hordynski operated on 11 patients so far with a lot of interests from our local surgeons. On a lighter note, after dinner tonight, our team spent a lot of time sharing our thoughts and feelings. What a wonderful time this short meeting had been. Our own lives are changed and not just our patients. Members are doing things they never thought they would or could do. Praise God. Friday both Team A and B will leave at 6AM. Our travel today would be 2 hours. Team C (surgery) will leave at 7AM. Below is Team B after a long work day seeing 217 patients, 37 dental sugeries, 110 pairs of glasses and thousands of prescriptions. Today our mission isn't about what doctors, surgeons can do but it's all about what human beings can do for one another in love. The mother and this young 10 year old child came in for help. The child had a brain tumor 5 years ago and was treated with the Gamma Knife by a very good local neurosurgeon. He had been followed up routinely and was doing well. The last MRI of the brain in October 2010 showed the tumor had regressed in size and patient had no symptoms. Two months ago suddenly his right eye became blurry and despite aggressive treatments, he is now blind. The mother is devasted of course. He has been such a good son, an A student.� Whenever mom was ill, he would ask "Mom, what can get for you to eat? What can I help you with?" and now whenever he wants mom, he has to fumble around to find and touch her. What would you do if you sat in front of this mother and child? These 2 elderly woman came in a couple hours apart.� The one on the left is an 82 year old soft spoken�widow whose husband died at the age of 35. She has 2 daughters that are married and moved away.� She now lives alone and every day she works in her little rice paddy next to her house, cleaning weeds. When harvest comes she would hire someone to harvest for her and pay it with her rice. She saves the little�rice left over to eat all year. The sad thing is she could only eat her rice with vegetables she grew in her own little garden, almost never had fish or meat because there is absolutely no money for it. The one on the right is an 88 year old woman who walked 2 hours on foot, taking frequent rests so she can make the journey to see us. Like the other woman, she is a widow with her children all gone, leaving her alone. She doesn't have a rice patty but raise a few chicken to trade them for rice and eat it with veggies. What would you do if you sat in front of these 2 beautiful old woman? This next young woman came in because of a lump in her breast. We sent her to get a biopsy. She was so trembling in fear, fear of what the result could bring. What would you do if you stood in front of her? Good night everyone, thank you for your thoughts and prayers. Leaving us encouraging comments helped us carry our days. The team left earlier at 6AM today�to make up for lost time on Monday.� Team A and B switched locations while Team C (Surgical Team) started their surgeries today and 5 cases were on the schedule. Team B worked at a steady pace and see the usual load of sick patients. This woman here has a lot of shoulder pain where she couldn't raise her arm to wash her hair. A simple injection of her shoulder allowed her to do this simple task and brought a big smile on her face. Near the end of the day this patient came in without an official invitation. It appears she has a venous malformation.� There were 2 previous attempts to fix it in Saigon and both times failed. She is sent for an MRI to better delineate the extent of the disease. We pray that this problem is contained so that our surgical team can operate on her next week. Near the end of Team B's day another patient came in with severe chest and upper back pain.� So severe she couldn't hardly move so we must admit her to the hospital for further work up.� We rented a van to take her to the hospital but at the same time we found out Team�A was so far behind and would not be home at least for another 2-3 hours unless Team B came to help. We decided to put this patient on the bus with Team B while the 4 doctors and 6 assistants used that van to go and help Team A.� Team B's dental was still working but the patient's pain was severe enough not to wait until they were done so the Dental Team was left behind to be picked up later. Team B's Doctors came to assist Team A with another load of patients.� By the time the clinic was done, it was 7:30PM. Everyone got home safely at 9PM for a quick dinner.� We will be leaving again at 6AM tomorrow. We are really tired but our spirits are high and we pray this spirit will continue in the coming days. We knew this first day would be difficult and it was but if it was why would we want to be here? Both teams left late, team B went further and despite not adequately equipped Team B has and will change lives. 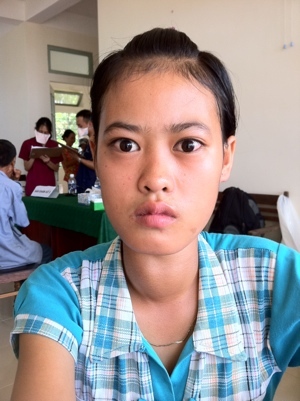 This 16 year-old girl with an enlarging goiter has been treated with medications for 3 years and couldn't have surgery. Our surgical team will take care of her next week. A middle age woman with chronic abdominal pain due to gall bladder stones will also be surgically treated next week. A 48 year-old woman came in complaining of shortness of breath. A simple chest x-rays revealed a massive problem. The entire right lung is filled with fluid. We fear this may be a lung cancer. Regardless, we must make her comfortable and she is admitted to the University Hospital for further evaluation and any possible treatment we could give her. Another patient came in with liver cancer. He has received 4 chemo treatments and 2 more to go but out of money. We knew any more treatment would still not alter the course of this disease but for his family to know without a doubt that they had done everything they could, we helped with the remaining treatments. Our team members' hearts are broken for these and �many more but that is precisely why we are here. Our most difficult days can never be compared to one day in our patients' lives. Our Team A was significantly challenged as well. We tried to see our last 20 patients of the day but the electricity went out and had to close the clinic at 7:30 leaving them to Team B for the next day.� We got home at 8PM, ate dinner and do more unpacking. Despite a difficult day, we look forward to a new day. Copyright 2011. Good Samaritan Medical Dental Ministry, Inc. All Rights Reserved.